Adolescence is a difficult phase in one's life. And when the concerned adolescent is a teenage girl living in Shimla, life does not get easier, especially if you are not size zero, or not too popular. In what promises to be a refreshing take on teenage life, Gippi fares well enough in the hearts and minds of the audience. Gurpreet Kaur (Riya Vij), a.k.a. Gippi, is a 14-year-old girl who lives in a cottage with her mother (Divya Dutta) and younger brother Boo Boo (Arbaaz Kadwani). The movie begins with the first day of her new class year. While Gippi revels in dancing to numbers from Shammi Kapoor movies, her best friend Aanchal (Doorva Tripathi) has other problems on her mind, like her increasing bust size and monthly periods. Gippi has not yet faced these issues, so her solutions to her friend are thoughtless and simple. Gippi does, however, have some other problems of her own. She is not very popular, and is the laughing stock of her class. Also, the class topper, Shamira (Jayati Modi), leaves no opportunity to ridicule the plump Gippi. Gippi has an admirer in Ashish (Aditya Deshpande), but he is too much of a nerd for her to pay attention. Besides, her father (Pankaj Dheer) is remarrying, and her mother does not seem to be taking it too well. With the help of her nerdy friends and her nail-polish loving brother, Gippi figures out how to fight an election, get over her father's impending marriage, and the truth about her extremely hot friend Arjun (Taaha Shah). Sonam Nair, who is also the director of the movie, has got the plot points and story flow right, to begin with. There is no unnecessary sequence sneakily put in to make it a profound movie. 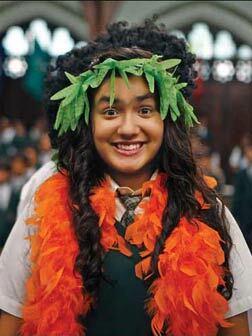 The story revolves around Gippi and her year in Class IX, and even more elaborately, on her relationships with those around her. She goes from carefree young girl to mature young woman in the course of the movie, when she realises that appearances are deceptive, and honesty (to the self and to others) is what matters the most. However, in the execution of the plot, there are a few loopholes. While trying to stick to a realistic portrayal of school life, Sonam Nair cannot help but bring in some fluff - in the language that the kids speak in, in their aspirations and dreams, and in their daily lives. There is a lot that the kids get away with, considering they study in a convent. Also, Gippi's mother is a little too cool for somebody who runs a beauty parlour and has a complex about her social skills. Some of the dialogues are lifted straight from the lives of rich kids in international schools in big cities. Shimla is a popular tourist destination, but the attitude of the middle class is nothing like their counterparts in, say, Mumbai. Riya Vij begins well, but she has a distinct city accent that is difficult to comprehend at times. Towards the end, her dialogue delivery becomes monotonous. However, her body language is terrific, and her chemistry with Taaha Shah has to be seen to be believed. Taaha Shah does a commendable job as the grey character who is neither a bad guy nor a hero. He is just what he is. In contrast, Mrinal Chawla, whose character has a thing for Gippi, seems a little uncomfortable in his role. Doorva Tripathi is a delight to watch. Aditya Deshpande and Jayati Modi are predictable. Arbaaz Kadwani is a discovery. Divya Dutta is restrained and effective as the mother of two adolescent children. Pankaj Dheer does his bit, with some trepidation, or so it seems. A lot (maybe a little too much) of thought has gone into the production and costume designs, and it shows - they do not blend in seamlessly. The cinematography is decent, though, and some of the sequences are lit very well. The music is peppy, and often interspersed with songs from Shammi Kapoor's movies. Strangely, Gippi's fascination for this veteran actor is never explained, and it just seems like a gimmicky characteristic for the lead. Gippi does have some language and references unsuitable for young children, so be warned about taking your young ones. They may ask a lot of questions relating to sanitary pads, bust sizes, reproductive organs and undergarments, later. Despite that, it is a must watch for those who love coming-of-age stories, and those who are coming of age themselves. Ignore the erratic diction, and you may just appreciate the fact that Sonam Nair is now a pioneer in teenage movies in India. Be the first to comment on Gippi! Just use the simple form below. fullhyd.com has 700,000+ monthly visits. Tell Hyderabad what you feel about Gippi!